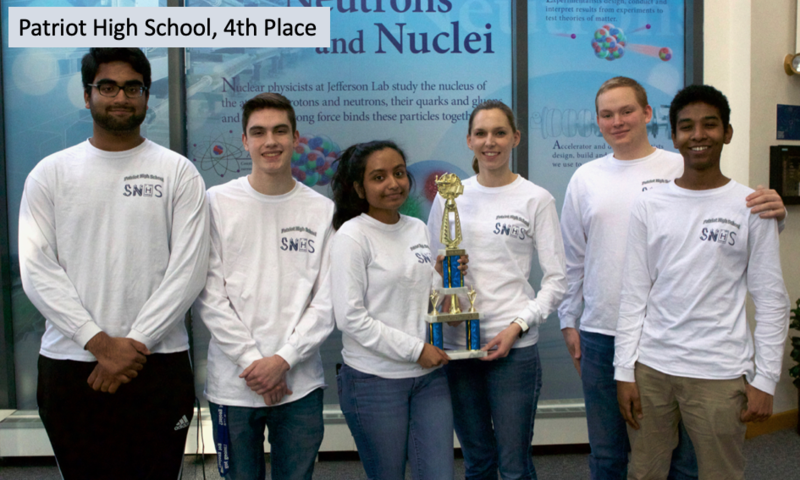 The top four teams who competed in the 2019 Virginia Regional Science Bowl: Thomas Jefferson High School for Science and Technology, Langley High School, Centreville High School and Patriot High School. 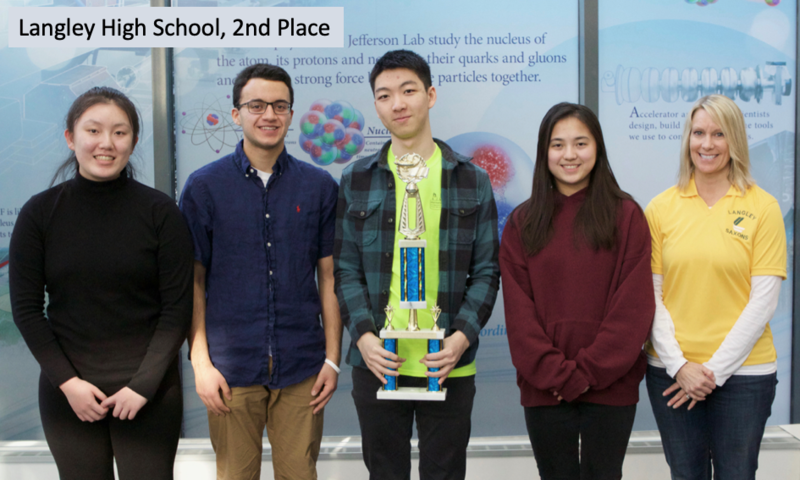 Thomas Jefferson High School for Science and Technology of Alexandria placed first among 16 teams who competed at the 2019 Virginia Regional Science Bowl Competition at Jefferson Lab on Saturday, Feb. 2. 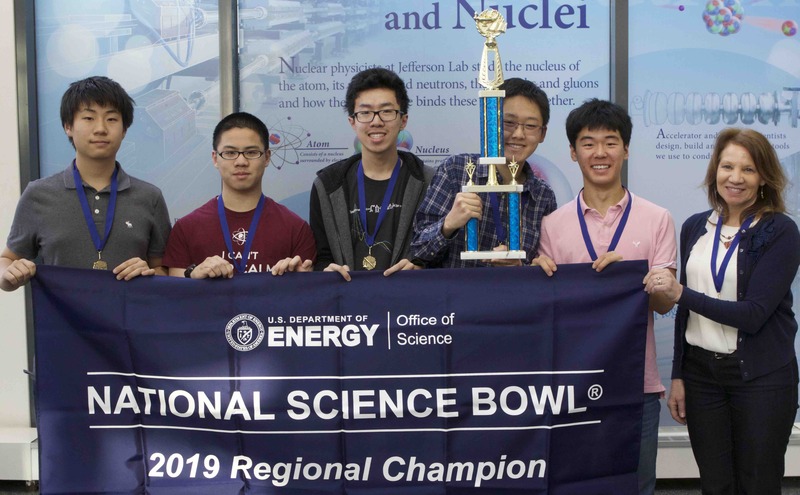 NEWPORT NEWS, VA -- The winning team of the 2019 Virginia Regional High School Science Bowl competition is Thomas Jefferson High School for Science and Technology of Alexandria. Langley High School from McLean and Centreville High School from Clifton placed second and third, respectively. Patriot High School from Nokesville placed fourth. The competition was held at the U.S. Department of Energy’s Thomas Jefferson National Accelerator Facility on Feb. 2. 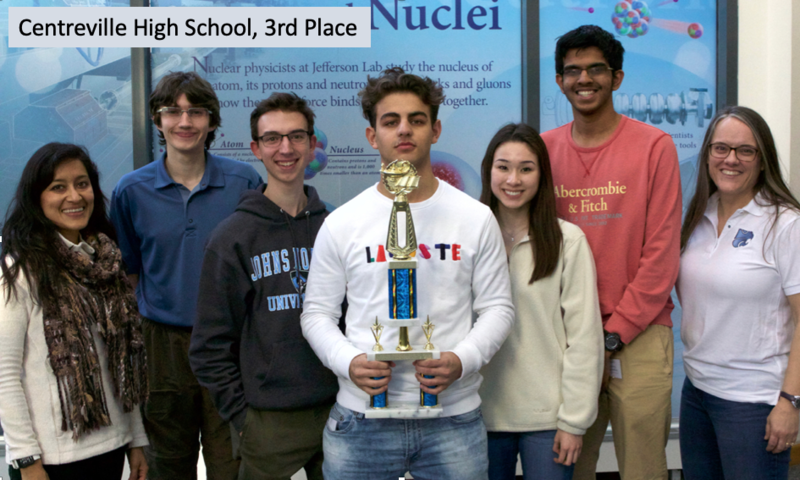 Thomas Jefferson High School will represent the Virginia region in the National Science Bowl® finals to be held in Washington, D.C., April 25–29. The team will compete in the academic competition and will also attend presentations by well-known scientists on current topics in math and the sciences. In addition to an all-expenses-paid trip to the competition, the winning school also received a trophy and $750 for its programs, and Patriot High School from Nokesville received a trophy for placing fourth. The second place team, Langley High School from McLean, and third place team, Centreville High School from Clifton, also received a trophy each, as well as $500 and $300, respectively, for their school programs. Teams from 16 Virginia high schools competed in the 2019 competition, including four teams representing Hampton Roads: Bishop Sullivan Catholic High, Hickory High School, Isle of Wight Academy and New Horizons Governor’s School for Science and Technology. The U.S. Department of Energy Office of Science manages the National Science Bowl® and sponsors the NSB finals competition. The competition, which is meant to encourage students to excel in math and science and to pursue careers in science, technology, engineering and math, has taken place annually since 1991. Since its inception, more than 290,000 middle and high school students have participated in tournaments around the country. In 2019, 65 high school and 50 middle school teams will receive trips to compete for the national title. More information about the 2019 Virginia Regional High School Science Bowl can be found in the event media advisory. See photos and videos from the event in Jefferson Lab's flickr photo album.